This is the Dubline Cardigan being knit for my oldest daughter. The goal for December is to finish the sweater and start the hood. The hood is attached to live stitches at the top of the sweater. Wish me luck!! At the beginning of this month I discovered Elm Street Quilts blog. She runs a monthly goal post. I decided to join to see if I can push myself to get the Dubline Cardigan for DD#1 done in time for winter this year. 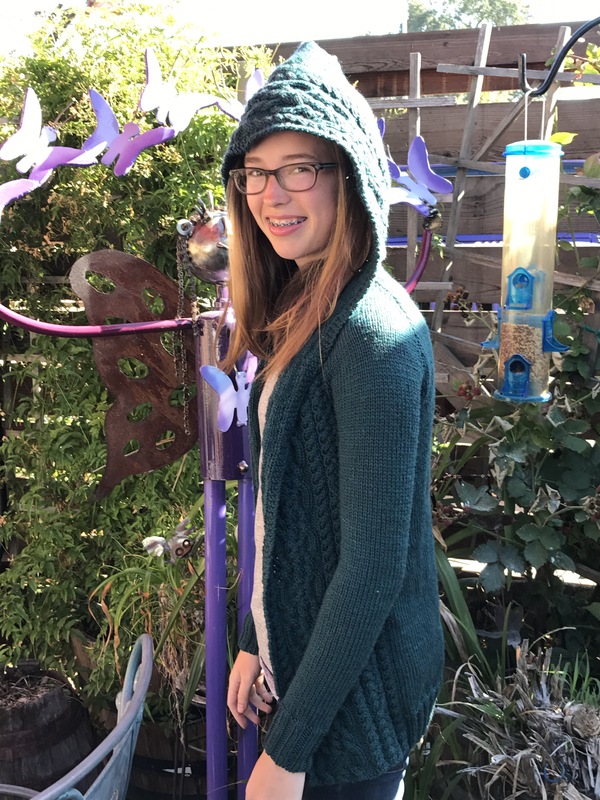 My goal was to finish knitting the sleeves and attach them to the body of the sweater. This is a raglan type sweater so after the sleeves are attached, the raglan shaping can begin. This is where I was at the beginning of the month. 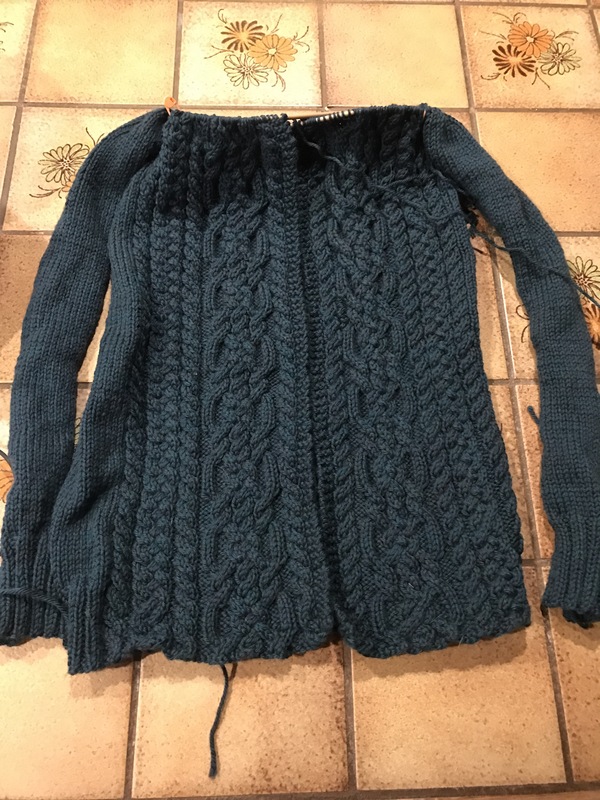 The body of the sweater was ready for the sleeves, but the sleeves were not quite long enough. DD wants them long enough that they touch her knuckles and have a thumb hole. 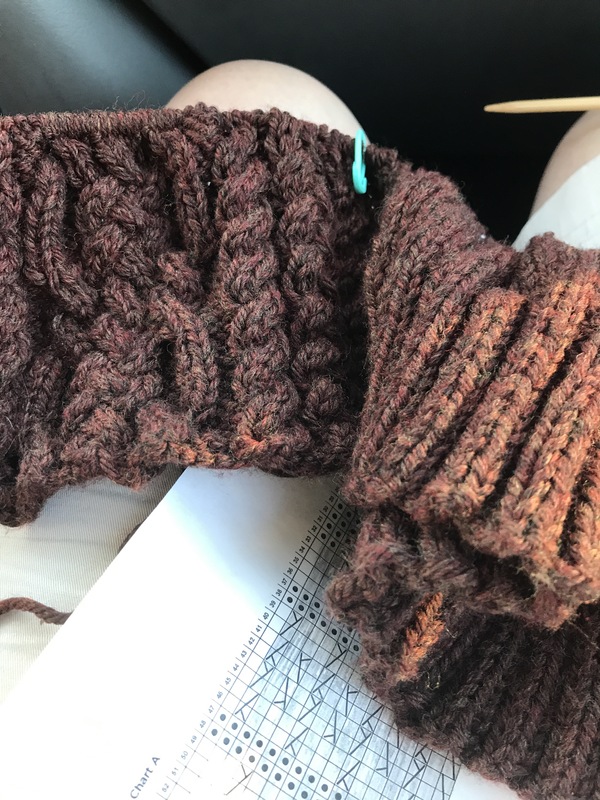 The pattern calls for the sleeves to be 14.25 inches long (this seems kind of short anyway), but her arm measurement from the armpit to the desired length was 24 inches. I added the necessary length. And now…the sleeves are attached and I can begin the raglan shaping. My goal for October is to finish the raglan shaping and be ready to start the hood. Wish me luck!! attach them to the body of the sweater. 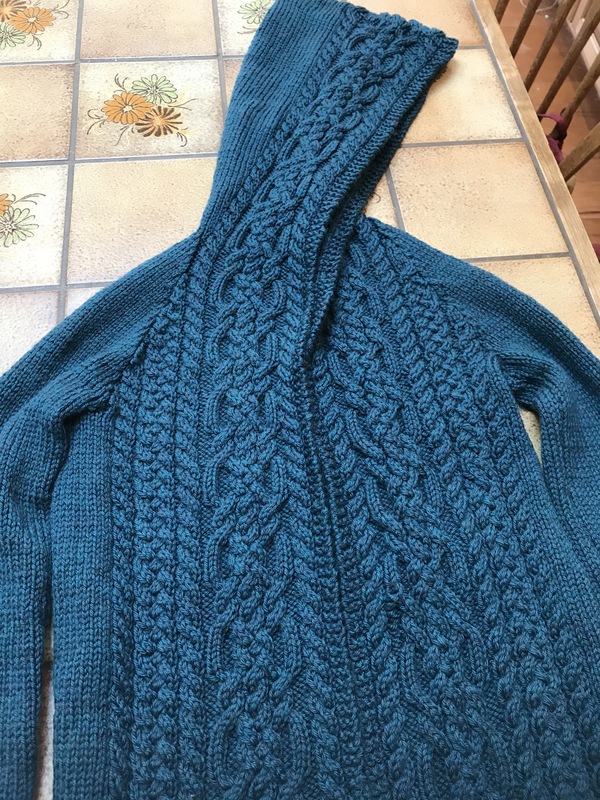 The color is more accurate in the photo of the sleeves, but I love showing the cables. 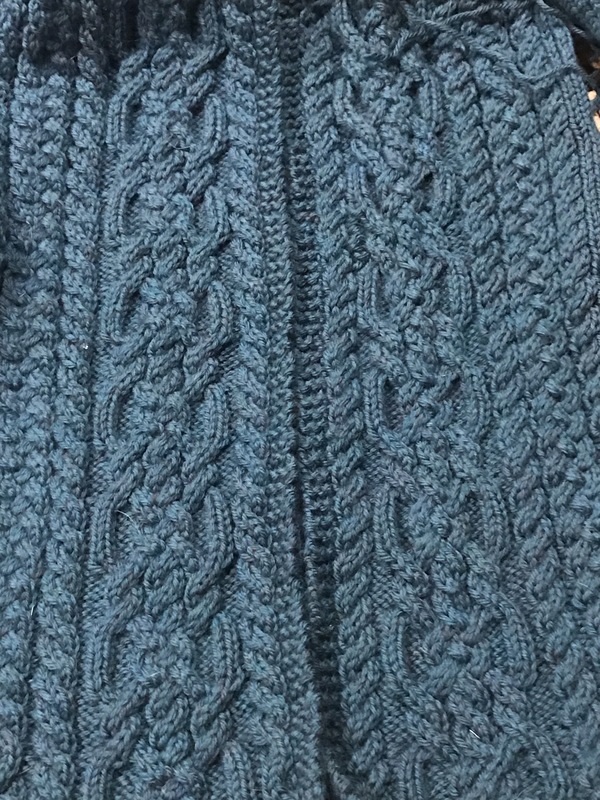 I really enjoy doing cables and this pattern is perfect. Wish me luck! The Dubline Cardigan has not gotten any air time lately. This is because I have been a little stalled on it. It’s not because I don’t like it, I absolutely do. It’s not because there are any mistakes, there are none-so far. I really like the yarn and the pattern. There is no explanation as to why I don’t work on this. I have been knitting on it once a week at our knitting group, but not any other time. There is progress, but it is slow going. It is now 10″ long in total, 7 3/4″ from the top of the ribbing on the back. Before adding in the sleeves, this needs to be 17 1/4″ from the top of the ribbing to the needle. LOTS more knitting to do! I really like the way it looks and more importantly, my daughter likes it! This is where it was the last time I posted about it – so I guess I have made good progress. Now I just have to keep it up! On our way for an impromptu camping trip. Camping is so much fun!!! Traffic getting to our site; however, was not such great fun. Good thing I brought my entertainment. Sweater progress for another daughter. This Knit Picks Swish Worsted is really a dream to knit with – it is so soft and is not splitty at all. 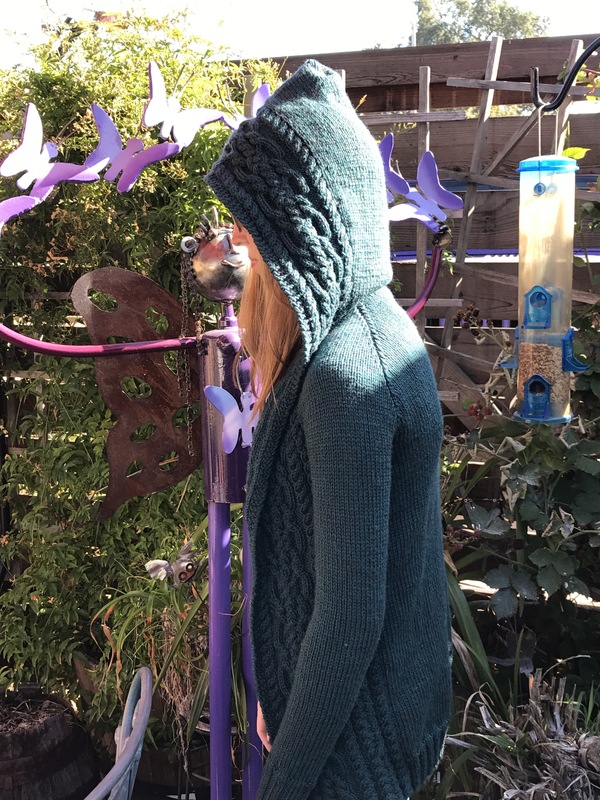 The Dubline Cardigan for DD#3! Hood up or down it looks great! Cable detail. 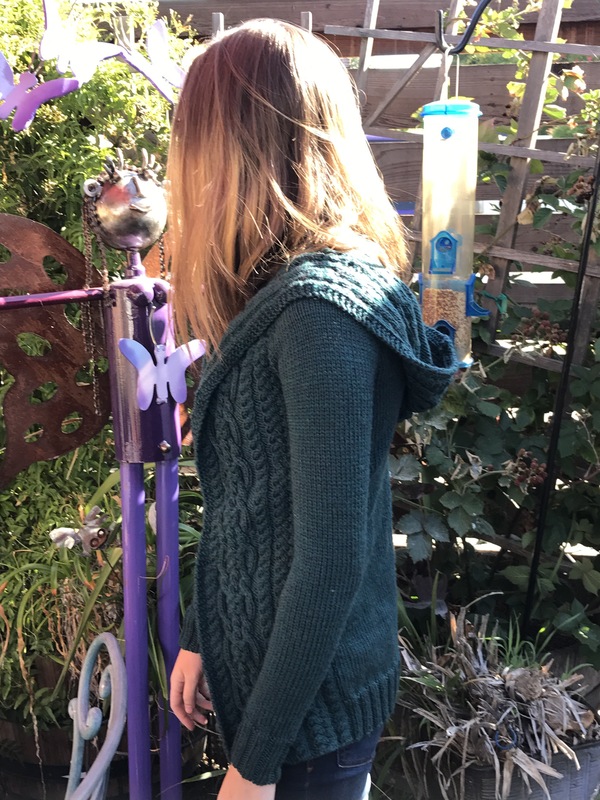 I loved every minute knitting this sweater. DD#1 now wants one so I just custom for a second one in a different color. I finally finished both the sleeves and the body of this cardigan and was able to put everything all on one long circular needle. Then I stalled out for a bit while figuring out all the decreases. Well, yesterday at my knitting group, I had time to really look at the directions and now know what to do!! After knitting several rows, it looks fabulous and it feels great to be in the home stretch of this project!!! LOVE, LOVE, LOVE these cables! !